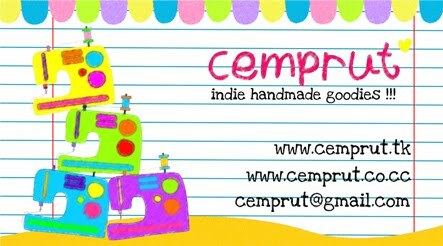 c e m p r u t: the name card dilemma...!!! finally finished the new name card of cemprut, design by me and draw by me with a help of the corel :) but the dealing still not finish yet... i'm still confused which desain that i choose. for the front the sewing tools ones or the sewwy ones ??? and for the back the white ones or the black ones ??? and i must give it to the printing shop this noon, oh my.... what do you thing guys...??? 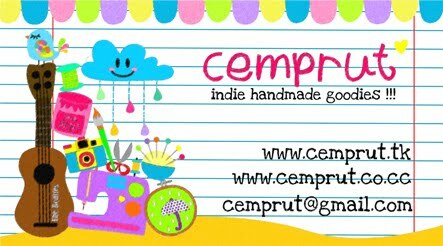 hla kok masih cenat cenut??? hmmm, berarti, km blm sreg tuh, masi bingung mau milih yang mana??? ..mba ditaaa... saya suka deh sama yang mesin jahit.. dan bagian belakang putih :) karena sewaktu-waktu white-space bisa ditulisi/ditandatangani untuk para fans-nya cemprut :D hihi..